How do you tell if feet are healthy and correctly balanced? 1/3:2/3 - two thirds of the foot should be behind the apex of the frog (apex of frog to heel), and one third of the foot in front of the apex of the frog (apex of frog to toe). It has been suggested that half the weight bearing surface of the foot should be behind the widest part of the foot (WPOTF)/centre of articulation (COA). 40-50% of the weight bearing surface of the foot should be in front of the widest part of the foot, and 50-60% behind it. 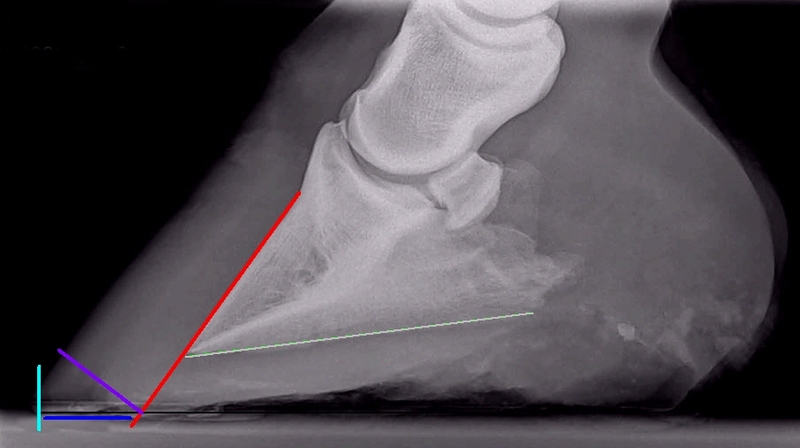 Gene Ovnicek mapped the widest part of the foot (WPOFT) on the sole, and found that the average distance from this point to the tip of P3 on x-rays ranged from 1.65" (size 000 foot) to 1.93" (size 6 foot). He found that the WPOTF was not necessarily the COA, the distance between the WPOTF and the COA varied from 0.13" to 0.41" in his research, and was related to the palmar angle. He found that with a palmar angle of >5 degrees, the WPOTF was behind the COA, otherwise it was in front. the tip of the frog was often around 1" in front of the COA (on a size 0 to 2 foot). Below: when breakover is brought back from its current position (turquoise line) to the point where the dorsal surface of P3 meets the ground (red line), note how the amount of foot in front of a line dropped down from the centre of articulation (orange) changes from more than half to half. With no bevel/mustang roll on the toe, more of the weight bearing foot is in front of the centre of articulation than behind it - 57:43. With breakover brought back to the point where the dorsal surface of P3 meets the ground and the palmar angle reduced to 5 degrees, the centre of articulation now bisects this foot. The frog should be broad with the central sulcus forming a shallow indent. The width of the frog should be 50 – 60% of its length. Depth – the whole length of the frog should reach the bearing surface (i.e. be weight bearing) – if the frog is lifted off the ground nerve stimulation is lost. The central sulcus should be wide and shallow (so an index finger fits in easily), with no thrush. A contracted central sulcus, seen as a split going up between the heels, is so common it may be considered normal - it is NOT healthy. This splits the digital cushion in half, causes pain and can lead to a toe first landing. All natural horse care - breakover - "the point of breakover on a healthy hoof should start at the white line. Any further forward and the laminae will be stressed." Care and Rehabilitation of the Equine Foot - Pete Ramey - Ch. 13 Debra Taylor p 244 - trimmers tend to measure breakover by projecting a line down the dorsal surface of P3 to the ground. Breakover distance is the distance between this point and the most forward extent of the hoof that is in contact with the ground. "In the laminitic horse decreasing breakover distance is crucial to minimizing ground reaction force on the jeopardized hoof wall during stance and stride." ECIR Group - Realigning Trim: "One fundamental aspect of the realigning trim backs the toe so that it is in line with the current position of the coffin bone. This reduces the pull or leverage on the lamina during breakover by allowing the coffin bone to breakover correctly. " Red - dorsal surface of P3 projected to ground. Turquoise - furthest forward point of hoof in contact with ground (actual breakover). Blue - breakover distance - the distance between red and turquoise. Breakover could be brought back to the point where the dorsal surface of P3 meets the ground using a bevel (or mustang roll) - purple line. Breakover has been brought back to the point where the dorsal surface of P3 meets the ground (red) by using a bevel (purple) or mustang roll. The former breakover is marked by the turquoise line. The heels have also been slightly lowered to give a palmar angle of 5 degrees. Note how this minimises force on the hoof wall at the toe, and moves the weight bearing surface further back underneath the horse. When viewed from the side, the hairline from toe to heel should make an angle of around 23 - 25 degrees with the ground (or with a line parallel to the ground). A shallow hairline angle - less than 23 degrees - suggests the palmar angle is increased, and that the heels are too high. A steep hairline angle - more than 25 degrees - suggests a low or even negative palmar angle - the heels may be too low, or the toe may have too much height. The coronary band is dynamic, and its shape will change according to how the feet are loaded. "When viewing the foot from the side, a healthy coronary band should be nearly straight with only a mild proximally directed arch." The lateral view of the coronary band should be similar to the medial view - lack of symmetry may suggest ML imbalance or sheared heels. Equine Podiatry - Floyd & Mansmann p 381 - "Generally speaking, when the foot is in balance, the coronary band is straight". Bulges or dips in the hairline suggest that the foot has areas that are over or underloaded, e.g. a long toe may create a jammed up appearance to the hairline in the heel region. When the foot is corrected, the hairline will straighten out, often within a few minutes. 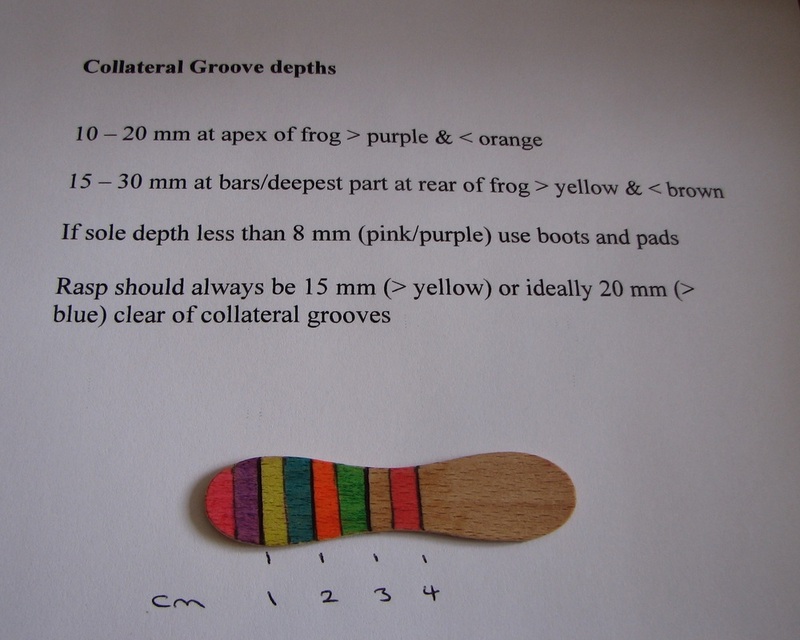 The depth and shape of the collateral grooves (CGs) can predict sole depth, P3 suspension off the ground, palmar angle and possibly heel development. CGs depths are measured from the ground plane (where the sole meets the wall) to the top of the CG (i.e. 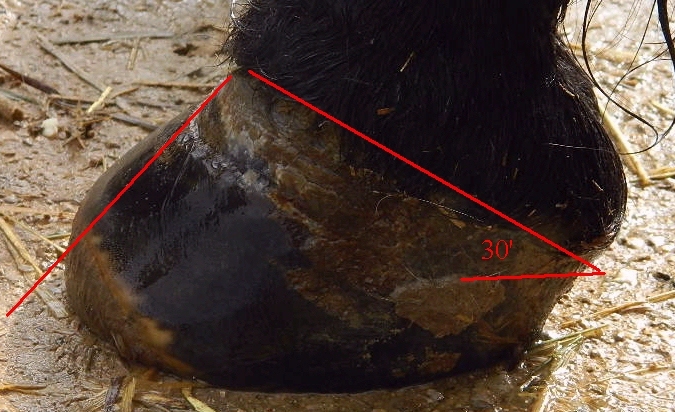 the bottom of the CG if you are looking at the sole with the hoof in your hand). At the apex of the frog there is a predictable distance (12-13 mm) (of sole/corium) from the mid-saggital plane of the bone (P3) to the top of the CG. The more CG depth, the further the bone is from the ground. Feet that have 0 CG depth at the apex are usually going to be flat soled. Important to recognise how close the bone is to the ground – paring concavity into that foot is going to be harmful. P3 suspension is important – horses want their pedal bone up off the ground – that’s why they like a shoe or hoof boot for protection if they are thin-soled. So when assessing a healthy foot, we should consider how far P3 needs to be above the ground. 24 horses with "normal" feet were studied. CG depth at apex was around 7-8 mm, got gradually deeper towards the back of the foot, was fairly even on both sides of the frog, and was around 17.5 mm at the deepest part. Their CGs became deeper quicker on the front feet (palmar angle around 6 degrees) than the hinds (plantar angle around 2 degrees) – the slope of the CGs was found to predict the palmar/plantar angle seen on x-rays. On x-rays sole depth at the tip of P3 was around 10-12 mm, P3 suspension at the tip of P3 (i.e. height of tip of P3 above the ground) was around 15-17 mm, and both sole depth and height above the ground were slightly greater on the hind feet than the front feet. CGs that undulate and are deeper at the apex than the mid-point predict a negative palmar angle – x-rays should be taken. CGs that slope upwards towards the back of the foot predict a positive palmar angle. The white line should be tight and barely visible. 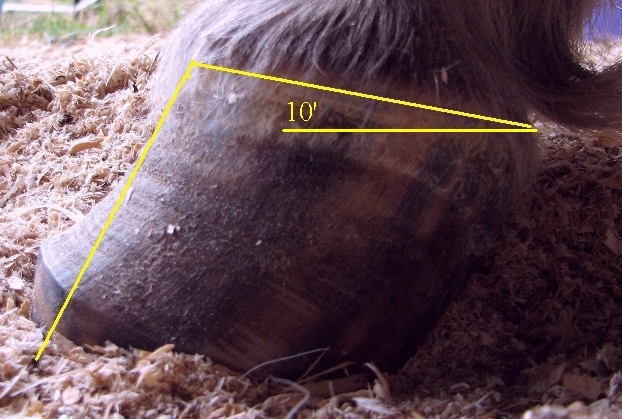 With the horse standing square with upright cannon bones, when viewed from the side, the toe should be parallel with a line drawn down the centre of the pastern. The digital cushion (DC) should be around 2” thick and 3-4 fingers wide. Density - the digital cushion should have the firmness of a tennis ball/well done steak/extended thumb muscle. You should barely be able to move the digital cushion with maximum thumb pressure. The digital cushion should fill the back of the foot to the top of the lateral cartilages. Many people may have never felt a good digital cushion - most likely to find a good digital cushion on a horse that has always been turned out. The lateral cartilages (LC) should be thick but slightly bendable with moderate thumb pressure, and should be 3-4 fingers apart. Heel height should be guided by the live sole. The back of the heels will normally be in line with the widest part of the frog, and the height of the heels will allow the frog to share in weight bearing. With the horse standing square with upright cannon bones, draw a vertical line down the centre of the cannon bone. The heels should come back as far as or close to this line. The heels should be balanced, i.e. both lateral and medial heel should make contact with the ground simultaneously when the horse moves. The sole should have natural concavity. Bars should end around mid-frog and stand erect, not be folded over. Folded over bars are likely to cause sole bruising. Thin-soled horses often have increased bar material, perhaps as a protective mechanism to elevate the foot, and this should be left while providing benefit but then popped out before it causes bruising. A line drawn down the centre of the frog and sole from heel to toe should bisect the foot fairly evenly. Many horses will have either the lateral side slightly wider than the medial side, or vice versa, but any significant imbalance should be investigated, and flare/stretched white line considered. The hoof walls should generally be straight with no flares or change of angle. Walls that are too long will flare. Flares weaken the foot and predispose the foot to cracks. When the inside (medial) wall flares and the outside (lateral) wall grows straight down, this can cause the foot to toe-in or become pigeon-toed. When the outside (lateral) wall flares and the inside (medial) wall grows straight down, this can cause the foot to toe-out. Linked to flares, the hoof wall should be straight with no change of angle. The hoof wall should be free of obvious rings. Rings that are wider at the heel than at the toe suggest that growth at the toe is being compressed, and that the heels may be too high. Rings that are wider at the toe than at the heel may indicate a negative palmar angle and may be seen on horses with navicular problems. Rings that are the same distance apart are generally considered to be "event" lines and may signify a change of diet or a stressful event. The hoof wall should be free from cracks. 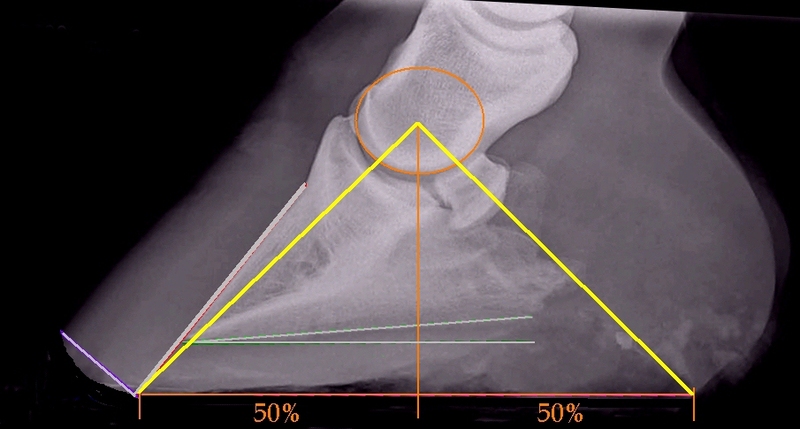 "CONCLUSIONS: Hoof conformation has a marked correlation to the forces applied to the equine foot. 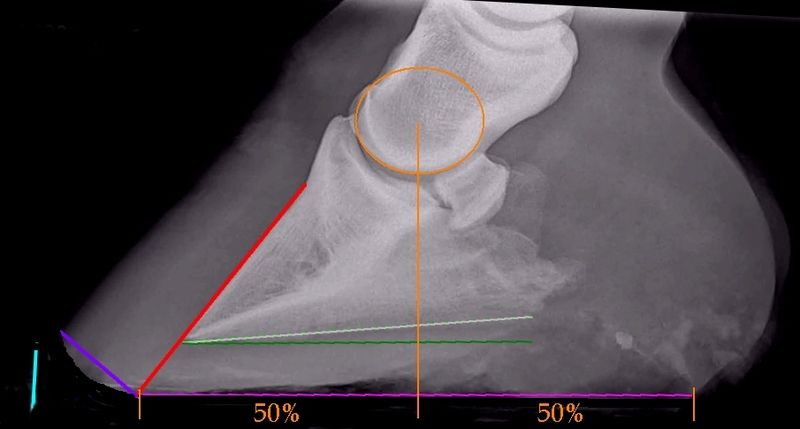 Heel collapse, as defined by the change in heel angle in relation to toe angle, appears to be an inaccurate parameter. The forces applied on the foot are well correlated to the changes in the ratio of heel to toe heights and the angles of the distal phalanx. POTENTIAL RELEVANCE: Assessment of hoof conformation should be judged based on these parameters, as they may have clinical significance, whereas parallelism of the heel and toe is of less importance." Equine Podiatry - Floyd & Mansmann p 383 "Ideally, the food should land either flat or slightly heel first.."